I am very lucky that my husband is extremely handy. We rarely have to call on professionals to fix things around the house. He works hard and is great with outdoor tools, indoor tools, hand tools, power tools, even air tools. As handy as he is, though, if he needs a tool for a task, no one can be sure when that tool will find its rightful home again. A few years ago, we had an ongoing summertime battle over a screwdriver. Or maybe three screwdrivers. They’ve never been found again to be able to say with absolute certainty. I needed the screwdrivers for mom stuff. Opening battery packs on toys, getting gunk out of moving parts, reloading the bubble machine, etc. He needed the screwdrivers for home stuff. All necessary repairs, that, in his mind, trumped toys. However, with three kids and three bubble guns, when one died, war broke out over the other two. I needed a stinkin’ screwdriver. So began my search for a pink screwdriver. Why did it need to be pink? Because then I could rightfully say that there was one place in the kitchen where my screwdriver would always be. All the other screwdrivers looked alike. Who knew if I left it somewhere or my husband did? Was it last used on the house or on toys? But my husband would look for a different one before using a pink screwdriver. I looked in local hardware stores with no luck. Same story at the big home improvement stores. 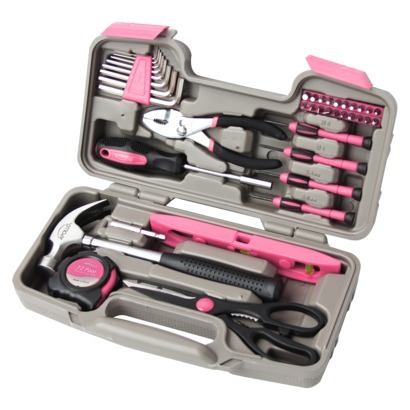 I got lucky searching online, though, and scored not only a pink screwdriver, but an entire pink tool kit. I use my tools all the time. From replacing batteries, to cutting those annoying wire ties in packaging, to dismantling doorknobs. Dismantling doorknobs, you ask? Why yes! While getting ready for school one morning this week, my younger son managed to lock himself in the bathroom and couldn’t get out. He was stuck in the bathroom, naked, while the clock ticked away our few precious minutes before school. 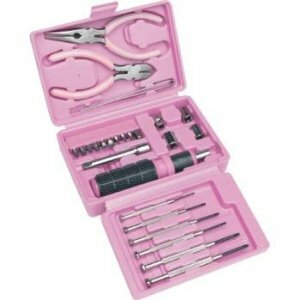 I sent my daughter down for my pink tool kit and got to work on the knob from the outside while he continued to try from the inside. Turns out it wasn’t his fault. The lock was, in fact, stuck. With my trusty pink tool kit, stored in exactly the right place, I was able to have him out with enough time to get dressed and make his bed. My kids see their father fixing things all the time. He is teaching them how to use the right tools for the right jobs, and how to try to fix things themselves. But now they also see me, Mom, fixing things for myself, too. 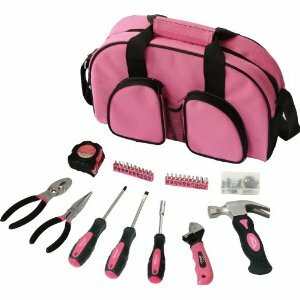 Need help shopping for your own pink tool kit? I’m here to help! This is mine. I love it — the multiple screwdriver heads are great. I just wish it included a hammer. Can’t beat the deal, though! If I had reason to get a new one, this would be the one I’d pick now. A few cool extras like a hammer, tape measure, and scissors for not much more money. I like the stubby hammer in this one, and the soft case, which might make it easier to store. 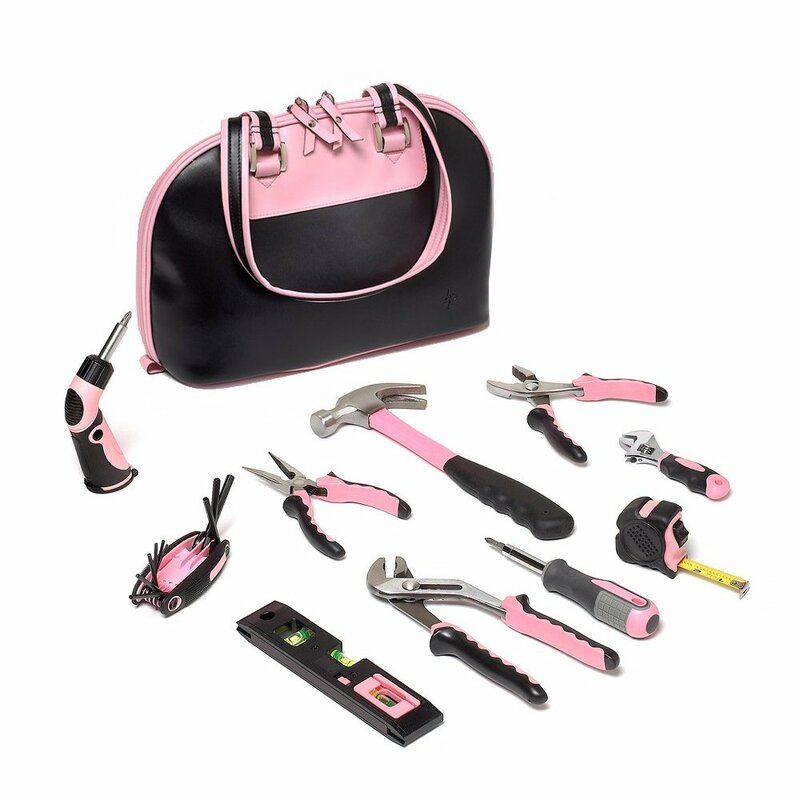 For you glamour girls, here’s the Breast Cancer Awareness little black dress of pink tool kits. 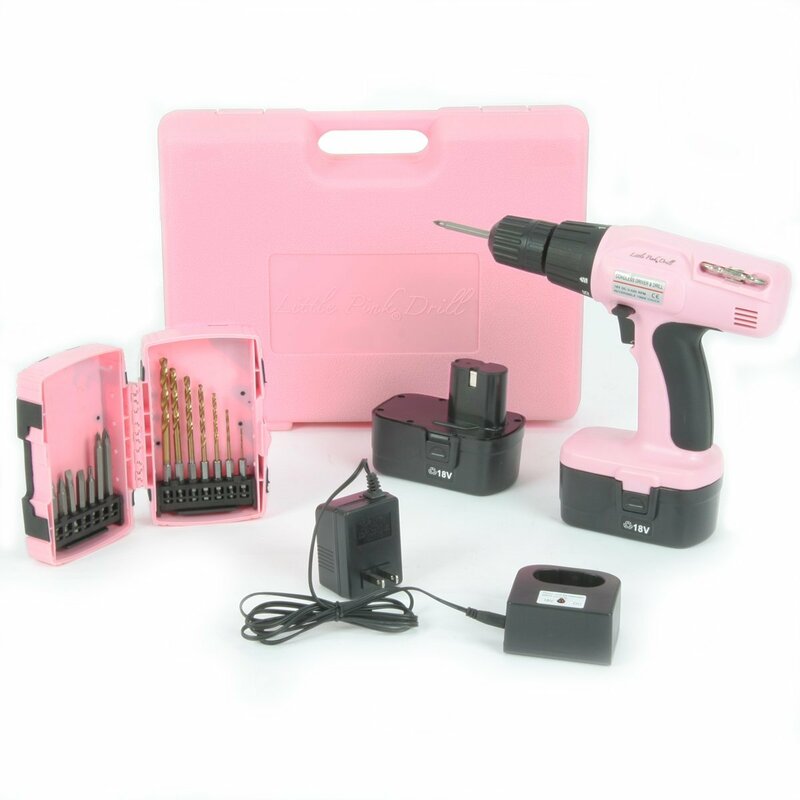 And, last but not really a tool kit at all, just still really cool… Now we pink girls can have our own 18-volt cordless rechargeable drill. 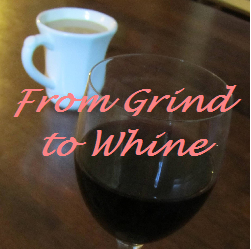 Just imagine, your very own power tool. This is the best thing I have ever seen. Seriously. My uncle gave me a hammer when I went to college that the handle unscrewed to reveal a small screwdriver. Probably honestly one of the best things I had in college. Still use it to this day. This whole kit, though. AWESOME.